The best way to start your day ! 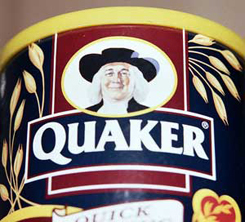 Quaker Oats is a natural source of Vitamins and minerals. And a natural source of growth too! A bowl of Quaker Oats with skimmed or semi-skimmed milk is a great and healthy start to your day. High in complex carbohydrates, which are the body’s main fuel sources, and rich in soluble fibre, oats have proven to naturally reduce cholesterol as part of a low fat diet.